Even though I love cooking (I do!) it can be a challenge to get dinner on the table with a busy schedule (and a patio calling my name these days). 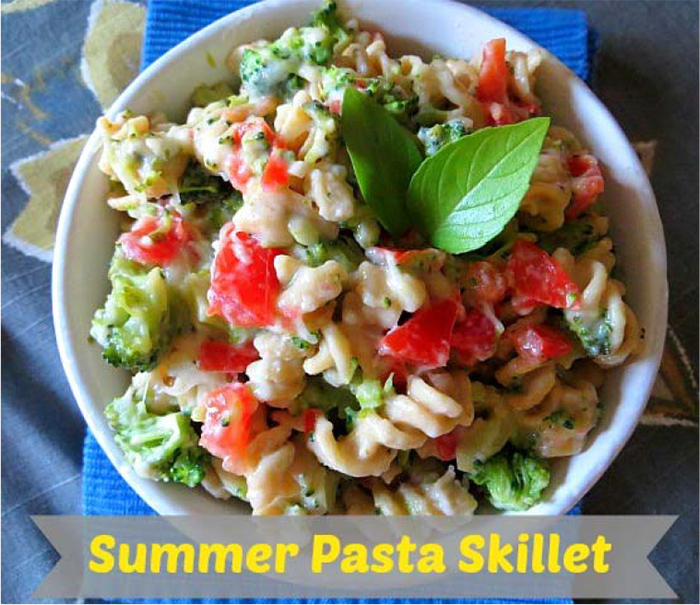 So this week’s recipe, Summer Pasta Skillet, is full of fun, sneaky cooking tips to make this daily chore ritual a little easier, and just maybe more fun! Hello, hello, hello! I hope you are having a fabulous week so far! Even though I love cooking (I do!) it can be a challenge to get dinner on the table with a busy schedule (and a patio calling my name these days). So this week’s recipe, Summer Pasta Skillet, is full of fun, sneaky cooking tips to make this daily chore ritual a little easier, and just maybe more fun! And did I mention we use butter in this recipe?! YEP! Butter. Now, before you sound the alarm and call the dietitian police on me, let’s talk about this for a minute. A little butter (keyword: little) can add a lot of flavor to a dish. And that’s exactly how I used it in today’s recipe. This creamy pasta skillet uses a roux for the base of the cream sauce (more on that later), where instead of using all butter like in typical roux recipes, I use 2/3 canola oil (for the healthier fat profile) and 1/3 butter (for its savory flavor). To round things out, I use skim milk, chicken broth, sautéed garlic, and parmesan cheese to add an extra depth and richness to the dish. And of course, the key to making any meal more nutritious is the addition of colorful, nutrient-dense veggies and toothsome whole grain noodles. Alrighty, so don’t make the same mistake I did. This dish comes together pretty darn quick; so let’s chop our veggies before starting the sauce so we don’t have to worry about it later, mmkay? This is also where the first fun tip comes in! To prepare the tomatoes, wash the outside and slice in half. Now, to prep the tomatoes in a jiffy, we’re going to use a MELON SCOOPER to remove the inside seeds (or a spoon if you don’t have a melon scooper) to keep the dish from getting soupy. Scooping out the seeds is much easier than coring the tomato and slicing down the sides. Chop the tomato into small pieces and set aside. Next, wash your head of broccoli under cool running water. Remove the woody stem of the broccoli and chop the florets into small, uniform pieces. Place in a colander in the sink. Okay, now heat a large pot of water over high-heat and, when boiling, add the rotini noodles. SECOND TIP ALERT: if your pot starts to boil over, making a complete mess out of your stovetop, lay a spoon across the top. It settles it right on down! Okay, on to our creamy, delicious sauce (almost done by the way)! 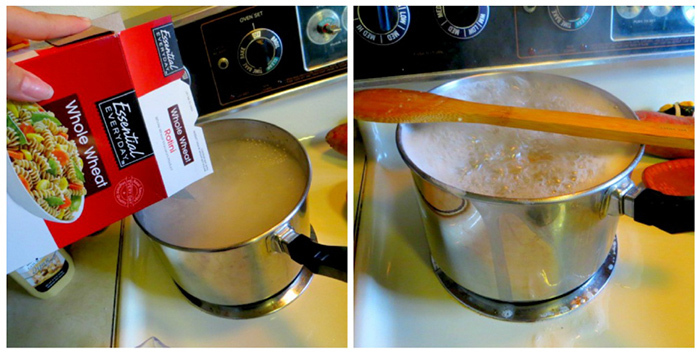 One of the most basic kitchen skills is making a homemade cream sauce, which is…Tip #3! 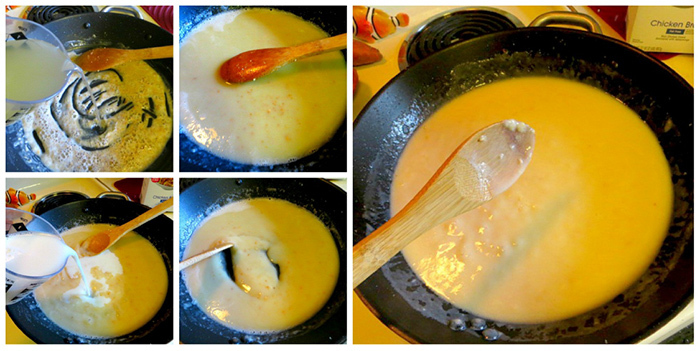 To start, we’re going to make a Roux (pronounced: Roo) which is the thickening agent of many cream sauces and gravies. 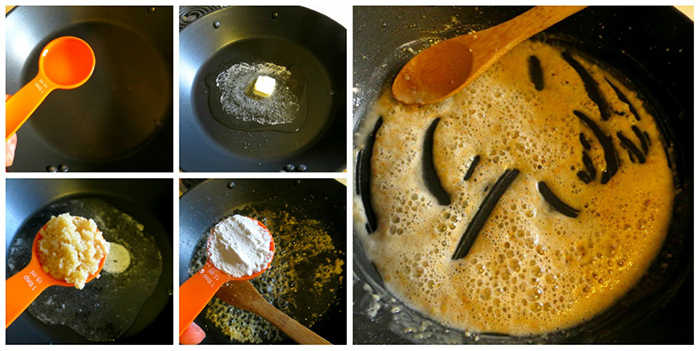 Simply put, a roux is made using 1 part flour to 1 part fat (butter and/or oil). You’ll add a tablespoon of butter (for flavor) to 2 Tbsp. canola oil. It’s important to measure out the butter and oil in this recipe because although we’re only using a little, the calories can quickly add up! When the butter has melted, add the garlic and sauté until fragrant, about 30 seconds. Next, mix in 3 Tbsp. of flour, stirring until the mixture is smooth; let cook for about 3-4 minutes or until slightly brown. This is the base of the sauce. Slowly stir in 1 cup chicken broth until smooth and then 1 cup skim milk. Let thicken, stirring very frequently; this will take about 4-5 additional minutes. By now, your noodles should be at least al dente (slightly firm but chewy). FINAL TIP!!! 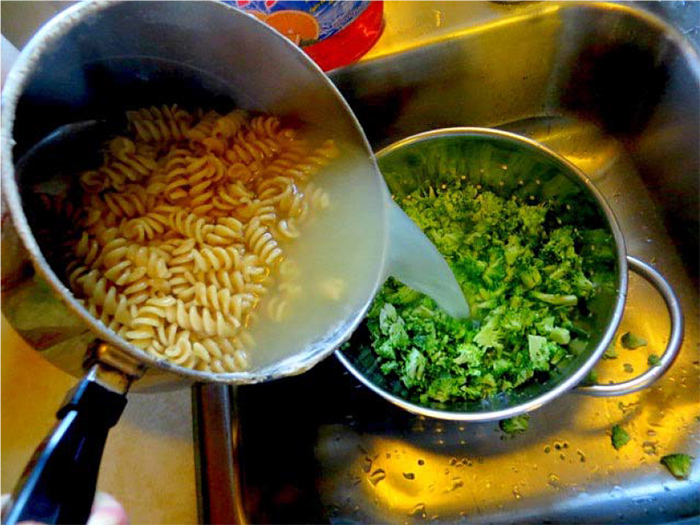 Drain the hot pasta water over the broccoli in the colander. This flash steams the broccoli bites, leaving them crisp tender and ready to eat Fold the veggies and noodles into the cream sauce and add ½ cup parmesan and 1 cup mozzarella. Garnish with fresh basil. I served mine with a side salad for an easy meatless dish, but grilled chicken would taste fantastic too! What are your favorite kitchen tips? Wash broccoli under cold, running water. Remove stem and chop into small, uniform florets. Leave in a colander in the sink. Next, remove seeds from washed tomatoes and chop into small, uniform pieces. Set tomatoes aside. Meanwhile, add pasta to a large pot of boiling water to begin cooking. Now, add 2 Tbsp. canola oil and 1 Tbsp. butter to a large skillet warmed over medium-high heat. When the butter is melted, add the minced garlic and stir until fragrant, about 30 seconds. Stir in the flour and let cook, about one minute. To the flour mixture, slowly whisk in chicken broth and skim milk. Stir constantly until mixture is smooth, bubbling, and beginning to thicken (about 4-6 minutes). 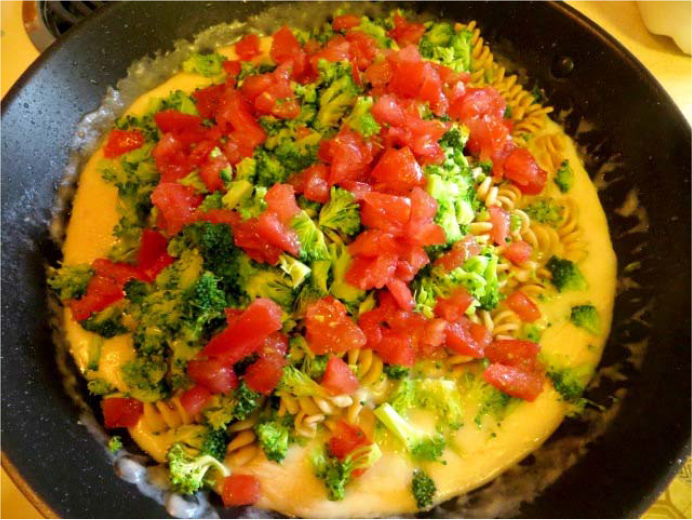 When the pasta is cooked, drain into colander with broccoli, flash steaming the broccoli. 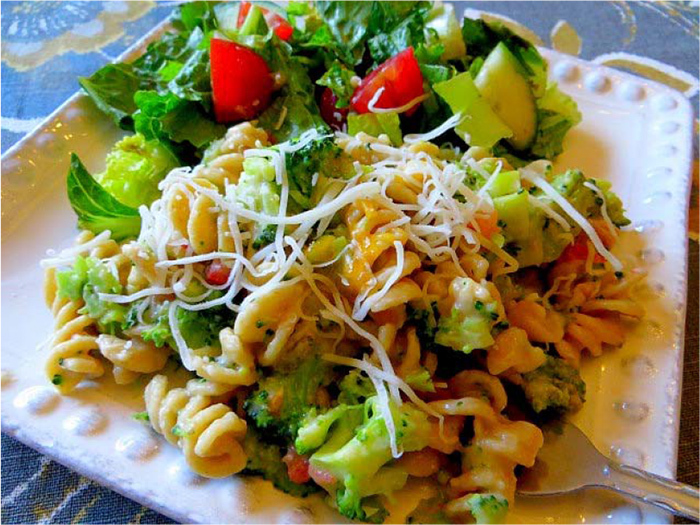 Stir broccoli, pasta, and tomatoes into garlic mixture. Mix in mozzarella and parmesan cheese. Serve with grilled chicken, if desired. 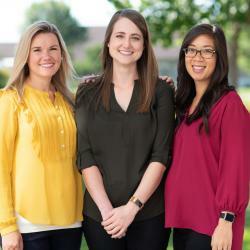 Jenny Dahl is a Registered Dietitian (RD) with Festival Foods and is certified by the state of WI.